Globally, there is growing interest in identifying effective strategies that prevent child rights violations like violence, child labor, early marriage and school dropout; intervening before, not after harm happens. 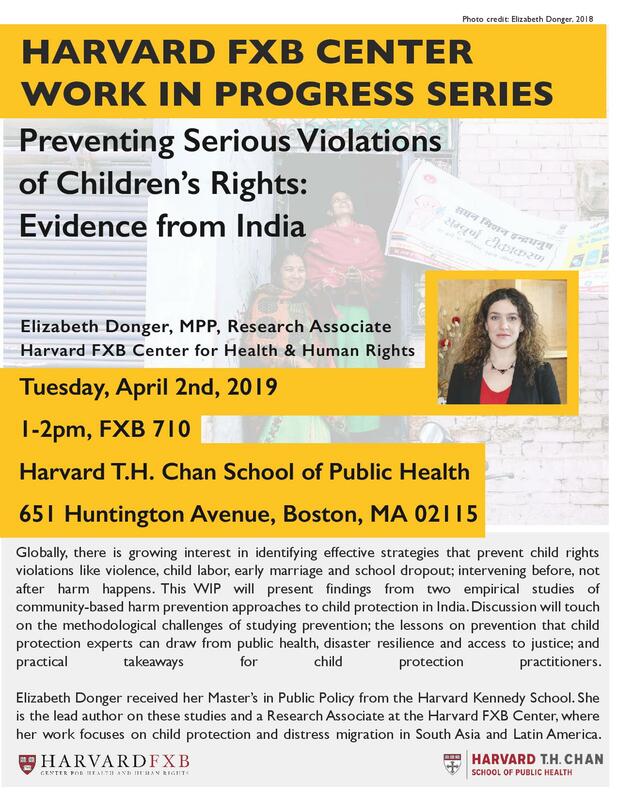 This WIP will present findings from two empirical studies of community-based harm prevention approaches to child protection in India. Discussion will touch on the methodological challenges of studying prevention; the lessons on prevention that child protection experts can draw from public health, disaster resilience and access to justice; and practical takeaways for child protection practitioners. Elizabeth Donger received her Master’s in Public Policy from the Harvard Kennedy School. She is the lead author on these studies and a Research Associate at the Harvard FXB Center, where her work focuses on child protection and distress migration in South Asia and Latin America.